... Sometimes you just have to go. Three kids, no job, no education, no furniture, no plan - that was me. I'd been a stay-at-home mom for the majority of my shaky relationship with my ex-husband. It was a relationship that started when I was barely out of high school. He and mothering were all I knew. I also knew that my marriage was unhealthy, bordering on abusive. But I was afraid. I was afraid of being alone. I was afraid of being a statistic. I was afraid of failure. But eventually, even more than that, I was afraid that my children would follow my footsteps. At first, staying was "doing the right thing." Then I realized that "doing the right thing" meant saving myself. That is the basis for my real-life account, "Pancakes Taste Like Poverty: And Other Post-Divorce Revelations." This memoir is a collection of my innermost thoughts and struggles collected from years worth of my blog posts and journals. Sometimes painful, sometimes hilarious and sometimes maddening this book touches on everything from absent dads to parenting to post-divorce dating. But most importantly, this book is about community, rebirth and love. I learned when you want a support group, you sometimes just have to go out and create it. I learned that even slow progress is progress. And most importantly, I learned that it is genuinely never too late to fall madly, deeply, head-over-heels in love...with yourself. There is no chocolate and wine, there are no trips around the world, no Tarzans to swing in and save the damsel. 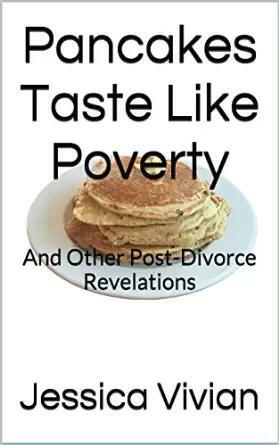 What you will find in "Pancakes Taste Like Poverty: And Other Post-Divorce Revelations" is honesty, struggle, triumph and survival. Jessica Vivian grew up in Mobile, Alabama. She escaped to Tampa, Florida where she attended the University of Tampa long enough to fall for a bad boy and marry him at age 20. They had three children together before she realized one should never marry a bad boy and they divorced after a ten year relationship. This experience is the basis for her memoir, _Pancakes Taste Like Poverty: And Other Post-Divorce Revelations_. As a full-time returning college student and homeschool mom, she's often found with her nose in a book or gossiping at a homeschool meetup. Other times she can be found watching re-runs of Matt Smith's episodes of Doctor Who, trying her best to memorize the lyrics to K-pop songs, over-analyzing the impact of her Myers-Briggs personality type on her interpersonal relationships, or planning to travel the world with her kids.